Omnadren 250 is a compound of Djelfa testosterone drug analogue Sustanon. At the heart of the duration that has four different testosterone ester, providing a smoother and long-term effect after injection. The drug is active until 2-3 weeks after application, so it does not require frequent dosing to maintain an effective concentration. Typically, the application is carried out with a frequency of 1-2 times per week (at equidistant days). Omnadren 250 has all the basic effects of testosterone, but differs in a uniform prolonged exposure, so highly regarded professional and amateur sport, using mainly for courses weight gain. The product compounds (mixtures) testosterone originally developed for medical applications. They were used, and is today used as a form of hormone replacement therapy in the production of low testosterone: the post-castration syndrome, eunuchoidism, endocrine impotence, hypopituitarism, menopausal disorders in men (including reducing libido, mental and physical performance), osteoporosis associated with androgen deficiency. In the sport of Jelfa Omnadren and analogues of other manufacturers - it is mainly effective dopants. These steroids are advised to athletes of different levels of experience - from beginners to professionals, to achieve rapid progress in the recruitment of muscle mass, improve athletic performance and strengthening the body. Omnadren 250 is recommended for sport mostly for men. It is very strong, not only anabolic androgen, but also, so when taking a woman has a higher risk of developing virilization. For athletes testosterone injections fraught with consequences in case of default of sexual activity before changes in male physical pattern (virilization - syndrome characterized by the development of the characteristics in women, inherent in men). Omnadren 250 effect: strengthening anabolic processes and weakening catabolic, rapid and steep set of muscle mass, increase athletic performance, endurance and efficiency, improving the function of joints and ligaments, relieving joint pain and strengthen the skeletal system, increased appetite and increased libido during the course of growth motivation and desire to train. Androgenization / virilization - acne, oily skin, body, body hair / face, baldness, increased aggression, violation of sexual activity; flavoring - fluid retention, high blood pressure, accumulation of fat in the female type, lipomastia or gynecomastia. During the course, there may be a sharp decline in testosterone, so be sure to not only post-cycle therapy, and may need to receive support drugs directly into the course to normalize hormone levels (Mesterolone - Proviron or equivalent, or gonadotropin - Horagon or equivalent; other testosterone boosters). In compliance with the recommendations and no contraindications side effects tend to be weakly expressed or absent. 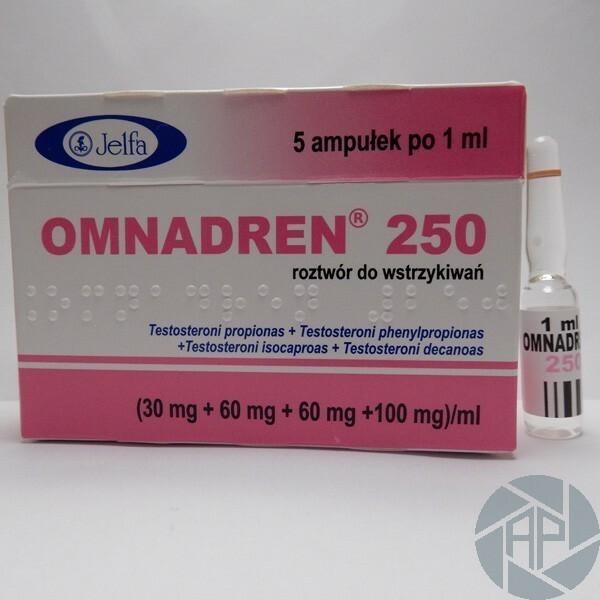 Omnadren 250 Contraindications: None known or carcinoma of the prostate or breast, private hypersensitivity suspicion. hormonal drugs testosterone are not recommended for women during pregnancy or breastfeeding, be prescribed with caution to persons under 18 years of age, in heart, kidney or liver failure, diabetes mellitus, prostatic hypertrophy, lung disease, sleep apnea or obesity. The product is relevant to virtually any type of modern sports. Especially in demand for energy in sports such as bodybuilding, weightlifting, weight lifting, arm wrestling and others. Dosage Omnadren 250 Djelfa are individually selected according to the needs and skill levels. The recommended dose is on average about 250-750 mg per week (respectively 1.3 ml per week). Receive excessive doses (above recommended) is not conducive to strengthening the pronounced effect of the drug, but it certainly increases the risk of estrogenic and androgenic side effects. Taking Omnadren 250 efficiently in a nutshell you can not describe. As a general rule, the rate of drug administration in combination passes. Depending on the tasks that can effectively be combined with Dianabol, boldenone, trenbolone, Turinabol, oxymetholone, stanozolol and others. It is important to understand that testosterone is one of the strongest even in providing visible results only steroids. The duration of the drug on average - total 6-8 weeks (if necessary and good tolerance may be longer - up to 10-12 weeks). To prevent estrogenic disorders receiving strong antiestrogen may be necessary during the course, as anastrozole (aromatase inhibitor). Help to make your own application rate can experienced consultants in the Forum Omnadren 250 (Jelfa). If you need a detailed guide, here they are easy to obtain. Register and ask questions of experts available in the master coach sports weightlifting professional bodybuilding.